Some movies are inextricably connected to an iconic character or unforgettable moment. 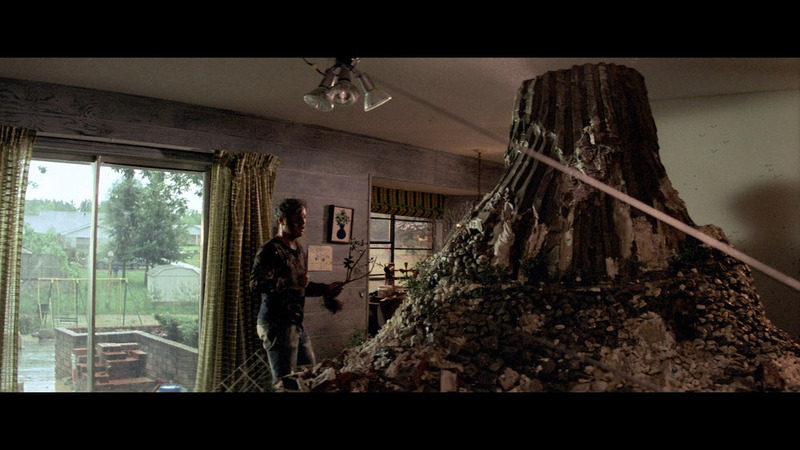 For me, Close Encounters of the Third Kind is all about the ending at Devils Tower, where first contact’s made with an alien intelligence and humanity doesn’t mess up the ‘handshake’. Everything up until then is entertaining and enjoyable, but even our hero Roy Neary (Richard Drefuss) is subconsciously driven to reach this spine-tingling climax. Steven Spielberg was fresh off the career-launching success of Jaws (1976) when Close Encounters was released. It was inspired by a meteor shower he witnessed with his father in New Jersey as a boy, which had previously inspired an amateur film he made for $500 called Firelight (1964) — of which a few scenes were reworked for this big-budget “remake”. Spielberg also incorporated moments from a short story called Experiences he wrote in 1970, so it was clearly an idea that was very much on the young filmmaker’s mind. The script’s original title was Watch the Skies (from a line in B movie classic The Thing from Another World), but the young Spielberg’s first draft met with negative feedback from screenwriting friends Willard Huyck and Gloria Katz. Paul Schrader (a few years away from enormous success writing Taxi Driver) was then ushered in to overhaul the screenplay, but Spielberg called Schrader’s 1973 script “one of the most embarrassing screenplays ever professionally turned into a major film studio or director”. Ouch. Numerous others wrote versions of Close Encounters in the mid-1970s, until Spielberg himself took full ownership and crafted a new screenplay with the help of an uncredited Jerry Belson. After the runaway success of Jaws, you’d think Spielberg would have the world at his feet, dying to work with him on whatever he wanted, but to his surprise the USAF and NASA both declined to cooperate on his sci-fi drama. NASA even wrote Spielberg a long letter claiming the release of a movie involving alien abduction would be very dangerous, which Spielberg took as a promising sign the subject matter had touched a nerve. Filming began in May 1976 (a little later than scheduled) with a budget of $2.5 million, which soon swelled to $19.4m, putting extreme financial pressure on Columbia Pictures. Studio executive John Veich later admitted it would never have been greenlit if the true cost had been known earlier. A lot of the money obviously went on the cutting-edge visual effects, which were overseen by the esteemed Douglas Trumbull (2001: A Space Odyssey), while the aliens themselves were designed by the great Carlo Rambaldi (King Kong), who’d work with Spielberg again on E.T: The Extra-Terrestrial (1983). Trumbull’s team were given $3.3 million to work with, a fortune back then, which equates to about $14m today. 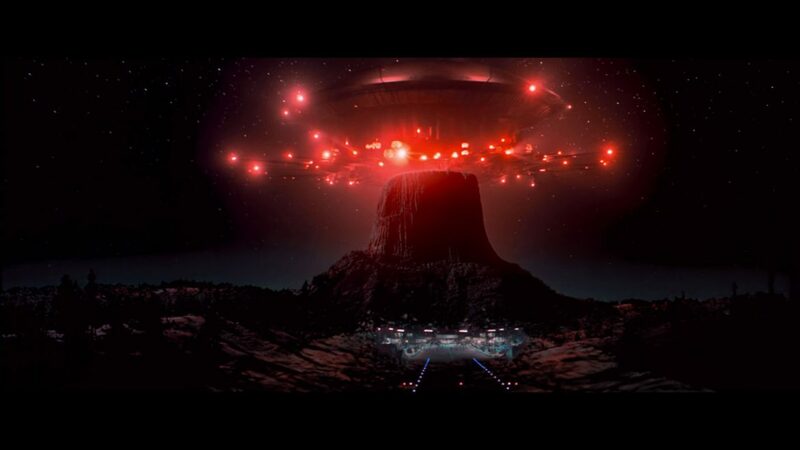 Close Encounters is also notable for being Spielberg’s first collaboration with film editor Michael Kahn, whom he’s worked with ever since, and for cementing his famous relationship with music composer John Williams after their success on Jaws. The soundtrack is another piece of quintessential early Williams, made famous for the iconic ‘five tone’ motif the scientists use to communicate with the aliens. 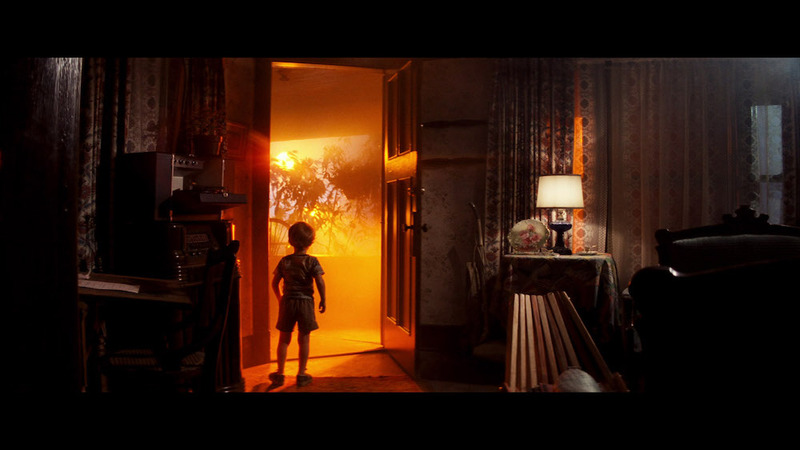 The story of Close Encounters is incredibly simple, and perhaps naively so to modern audiences who’ve grown up on the sci-fi movies that came in its wake. But it’s worth remembering that the idea of alien abductions and scientific ways to communicate with alien life was pretty fresh in 1977, or had certainly never been brought to cinemas in such a down-to-earth way before. Audiences were still used to the cheesy B movie ideas about spinning flying saucers landing on the White House lawn and for aliens with large heads and tin foil costumes to speak perfect English. They certainly got a wake-up call in the late-’70s with this and Ridley Scott’s Alien (1979). A lot of groundwork for future sci-fi was laid by Close Encounters, in terms of simple storytelling grammar when it comes to exploring the otherworldly. You can see its influence in Robert Zemeckis’s Contact (1997) and Christopher Nolan’s Interstellar (2014), not to mention the ships in Independence Day (1996) likewise bring their own weather as they enter the Earth’s atmosphere. 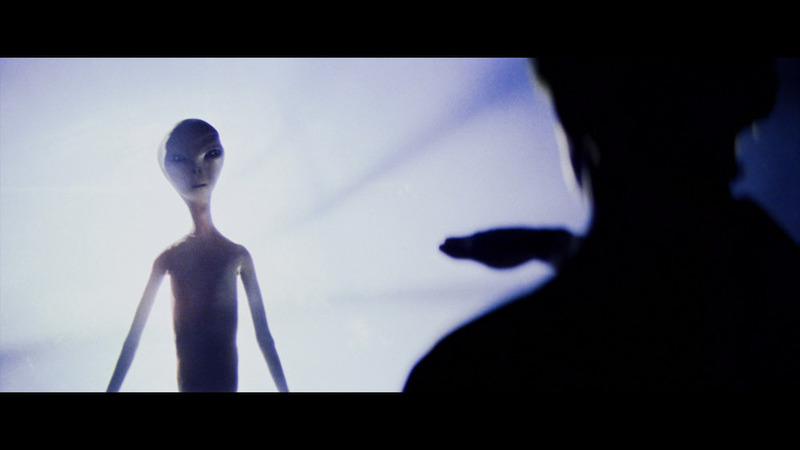 An imposing quasi-religious effect Roland Emmerich undoubtedly took from a sequence in Spielberg’s film. 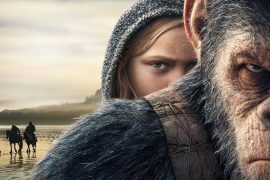 One sign of this movie’s age, but also Spielberg’s strengths as a director, is how the story escalates visually. In an early scene, a group of air traffic controllers deal with a UFO, which is only ever seen as a boring green blip on screen. It was possibly a budget-saving measure (the same scene today would be told from the perspective of the in-air pilots, not the men on the ground), but it also sets your expectations low, so by the time we’re witnessing a full-blown symphony of sound and visuals around Devils Tower you’re utterly mesmerised and delighted by the scale of what’s happening. 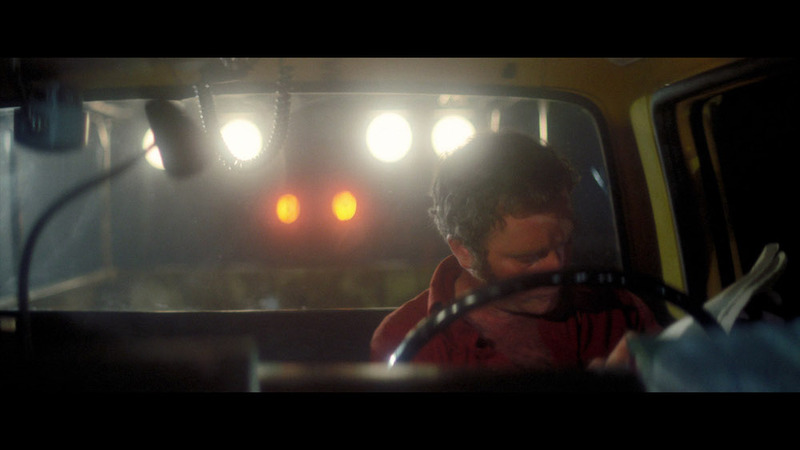 Not that the movie teases you too badly, because spinning ships are often seen flying overhead, most notably when Neary’s in his truck and a pair of lights push up behind him. He mistakes them for a vehicle on the road, waving them to pass around, and we watch as the lights mysteriously rise upwards. Classic Spielberg. What surprises me about Close Encounters is how unchallenged and widespread the initial appearances of the alien ships are. I always misremember the character arc of Roy Neary, after he encounters a UFO one night in his pickup truck at a tranquil railroad crossing. I expect the story to concern the fact nobody else believes him, but the truth is there are three police squad cars who give chase to some UFOs shortly after Neary sees them. 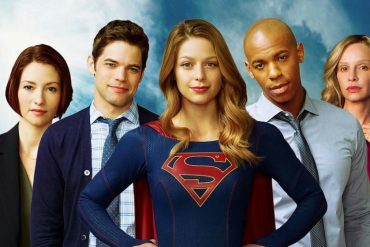 And it’s not long before there are scenes where townsfolk witnessing flying saucers swooping around all around. It’s not really that Neary is disbelieved, just that he starts acting so abnormally after his experience; driven to create sculptures of a strange triangular mass in mashed potato, modelling clay, and eventually the contents of his neighbour’s garden. His wife Ronnie (Teri Garr) promptly leaves him with their kids. 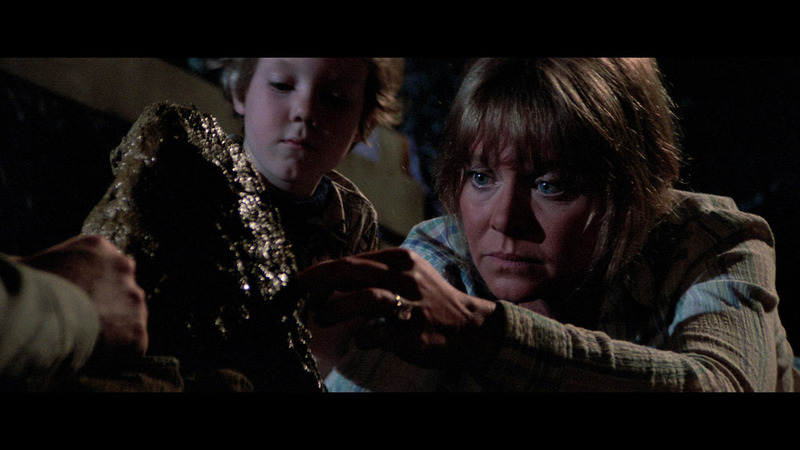 Really, Close Encounters is about the devastating effect on Neary’s family that his obsession has after he becomes obsessed with the UFOs he witnessed. Dreyfuss is great in this role and there are some excellent moments where his wife and kids watch him behave so erratically, with tears in their eyes as their father apparently succumbs to early dementia… but I’ve always felt the approach is a little too safe. I mean, there’s never any doubt that Neary’s telling the truth because we saw the alien ships ourselves, and I sometimes wonder if the story could have been improved by planting some doubt in our heads as the viewer. What if Neary was a drunk? Or was older, so it was actually very possible he might be going senile? As it stands, there’s really no mystery to anything, as the opening scene involves missing WWII airplanes being return. I’m not saying I know better, but I do wonder if a slightly older Spielberg would have done things differently. He’s previously admitted that he would never have the movie end with Neary happily leaving his family behind, without even saying goodbye, just to disappear in the alien mothership. Spielberg wasn’t a father in the 1970s, so he underestimated how being a parent changes a person. I must admit it’s now very conspicuous how little Neary contemplates the repercussions of his monumental decision. It’s very likely he’ll be returned to Earth decades later from the perspective of his wife and kids, who’ll be grown up by then. Or could maybe have passed away while he’s gone. There’s arguably more drama to follow in the story of Roy Neary, which this movie doesn’t contemplate. Christopher Nolan certainly did when devising his own sci-fi tale, Interstellar, of course. There’s always something new to discover about Close Encounters. Or there has been, for me. Some of my thoughts in this review are relatively new, as my own circumstances and age have made me reassess the story and behaviour of its characters a little more. I found it quite a scary movie as a kid (certainly the sequence where a little boy’s bedroom of toys start to come to life), but now it’s become quite life-affirming. Some movies get things so perfect that it’s hard to improve on what they achieve, and that’s how I feel about the ending where a team of scientists communicate with the aliens using the ‘five-note tonal phrase’. The entire situation and how it unfolds has a bewitching sense of realism, only slightly tarnished by shortcomings with the alien creatures themselves — which have dated as effects, and are clearly now just weird puppets or children wearing face masks. However, any problems are entirely aesthetic and do nothing to undercut the awe-inspiring power of the moment that chandelier-esque mothership comes down from the heavens. The version of this movie being reviewed was the 1997 Director’s Cut. writer & director: Steven Spielberg. starring: Richard Dreyfuss, Teri Garr, Melinda Dillon & François Truffaut. Next articleCompetition: Win OFFICE CHRISTMAS PARTY on Blu-ray!